Ald Redaynia is a remote, ruined Velothi tower, located at the western end of the island north of Urshilaku Camp. This tower contains the Bittercup, a unique artifact which is involved in a Thieves Guild quest. The Skeleton War-Wizard here also holds the artifact Vampiric Ring, which casts a very effective Absorb Health and Fatigue spell on touch. Also be sure to check out the flooded lower level which is well hidden as it appears to be blocked off by rubble. There is, however, a path between the rubble and the wall which only becomes visible when you move to the right of the doorway. The key to access the tower's top level awaits those who find this somewhat hidden area, as does a submerged chest full of leveled loot. 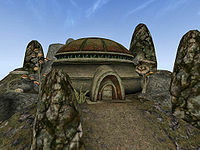 The book Before the Ages of Man states that Ald Redaynia was one of the towers on Vvardenfell built by Aldmeri explorers in the middle Merethic Era. NPCs will state that Ald Redaynia is a small village. However, this is untrue, as no other buildings (or even living people) are located anywhere near the ruins of the tower. This page was last modified on 14 June 2016, at 23:01.